Teenage Mutant Ninja Turtles are back! As a child of the 90’s, and a boy to boot, TMNT was a staple of my childhood. Of course being named Michael, Michelangelo and I were basically indistinguishable (it helped that my favorite color was orange). When I learned that TMNT was making a comic resurgence I was obviously ecstatic, and Eastman didn’t let me down. The story begins with an alley scene where Splinter and three (COUNT THEM, THREE) turtles, all in red masks, are facing off against a group of street thugs led my a one-eyed cat man whom Master Splinter refers to as 'Old Hob'. It’s clear that Hob and the Turtle family have some history that we aren’t privy to. Splinter, in his classic wise learned man style, tries to talk Hob out of a fight, but no dice. The Turtles fight the street thugs while Splinter internally comments on their styles and makes a metaphor to nature. We see some thugs fall to katanas, a bow staff, and to nunchucks. Splinter straight up dominates Old Hob and the Turtles leave the scene. During the fight, Old Hob makes reference to a FOURTH turtle that no one has heard from. Splinter breaks down in tears after the fight for his lost, fourth son, Raphael. Speaking of Raph, we meet up with him somewhere in the suburbs wandering aimlessly until he stumbles on a house where an old man is in the midst of abusing his son. 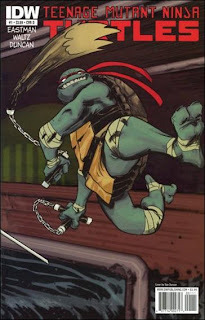 Being a Turtle, Raph lunges through the window to fight for the kid. Intermixed in there is a somewhat less interesting flashback sequence of a young woman named April O’Neil getting a job at a research lab that is testing something on four turtles and a rat. The art and the inking are really cool for this issue. It reminisces of the gritty comics that launched the Turtles into the spotlight that would see them into no less than two long running cartoon series and at least four feature length films. While reminiscent it is definitely a little bit more refined and actually colored. To put it simply, the Turtles grew up with me. Writing and art are in almost perfect sync on this one to give a very enjoyable comic experience. If you loved the Turtles of old (regardless of what your definition of old is) this is a definite read you would enjoy. Michael Knoll is a contributing writer at Champion City Comics.